This article was originally posted on Brave New Coin, with images and additional edits by myself. When the ICO market exploded in 2017 it was promptly following by the emergence of dozens of ICO rating agencies — but to what extent should they be relied on when making investment decisions? With the rise of ICOs also came the rise of the 'ICO economy', which refers to the economic activity that has sprung out of the boom in initial coin offerings, which require a range of peripheral services to succeed. Developers, copywriters, digital marketers, social media managers, PR agencies, lawyers, strategic advisors, media outlets, and ICO rating agencies are all participants in the ICO economy, and everyone is benefiting. This is arguably an excellent development that shows how cryptocurrencies and blockchain technology are creating jobs and are a driver for economic activity. However, as we know from the wave of ICO scams, underperforming ICO-funded blockchain ventures and questionable ICO marketing practices, some participants in the economy have little regard for business ethics. Unfortunately, some self-proclaimed ICO rating agencies reportedly fall into this category. You can get your ICO listed on ICO Bench for free... if you can wait up to 4 weeks. Or you can pay them a bunch of money to get listed right away. Ethical? According to a recent report by Swiss startup Alethena, it is very easy for a blockchain startup that is launching a token sale to buy a good rating on a popular ICO rating website. 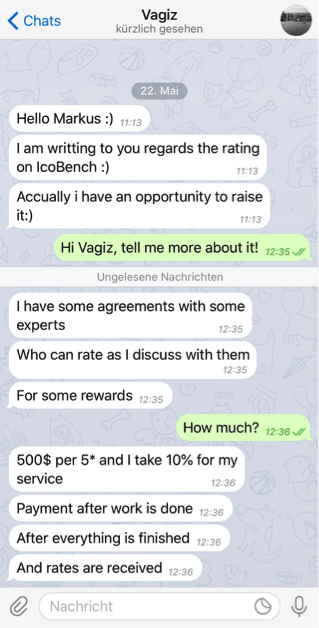 In the article, Alethena co-founder Markus Hartmann details how, shortly after its ICO was listed on popular ICO rating platform ICOBench, his company was contacted via Telegram by people selling positive ICO reviews on said platform. 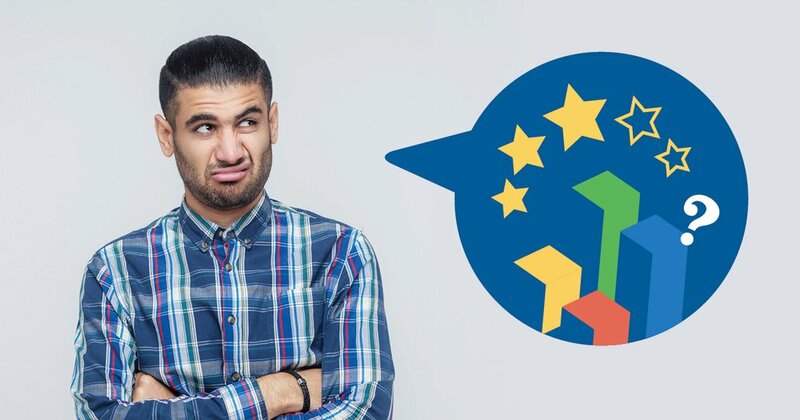 Alethena was reportedly contacted by two separate individuals who ended up selling the startup four positive ratings for around $1,500 worth of ether (ETH) that resulted in it receiving an inflated ICO rating on the site. This deceptive practice went as far as allowing the startup to write its own review under the name of supposed blockchain 'expert'. Funnily enough, the “expert opinion” written by Alethna contained the letters S-C-A-M at the beginning of each paragraph, which the startup purposely wrote to highlight these dubious backroom Telegram deals. It needs to be noted that ICOBench compiles reviews of several individuals who claim blockchain expertise as opposed to offering an evaluation itself, which means this practice of paid-for ICO reviews may happen without the knowledge of the platform’s operators. 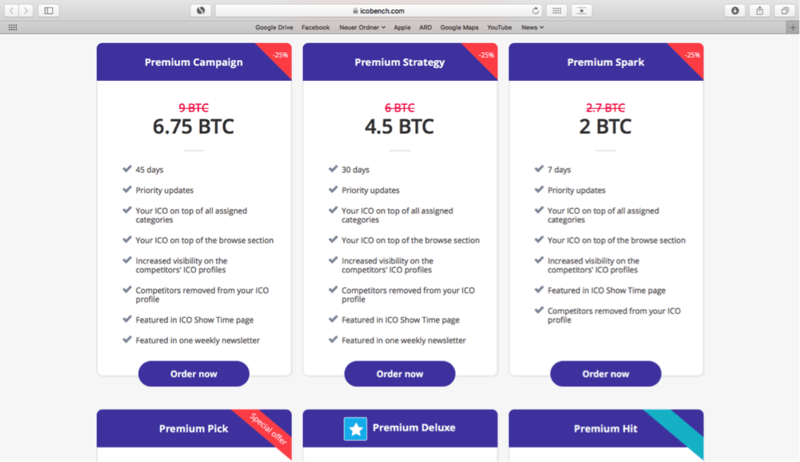 Having said that, despite the publication of Alethena’s report, its paid-for ICO reviews remained visible on ICOBench.com for some time. In a delicious irony, after the fake reviews were removed, one of the other experts who had previously rated the company's management team a '3' dropped that to a '1' saying he "originally ranked this as 3,3 and 3 , but reduced team to 1 as it has been proven they were paying for ratings." Of course, is it easy to argue that a startup that is raising funds through a token sale to build an ICO rating agency itself, is highlighting the flaws of its competitors only to position itself in a good light. Nonetheless, the report illustrates what many industry experts have been suggesting for a while, which is that ICO ratings are often not as independent as they claim. Let's start with the question: “If you can't trust ICO ratings, what can you trust?”, there is no simple answer. There are ICO rating platforms that employ ex-Wall Street analysts who conduct in-depth research on token sales before sharing their verdict on the project. These ratings can be valuable indicators of a project’s viability and potential profitability and are definitely worth a look as part of an investor’s overall research into a project. Then, there are platforms run by “online entrepreneurs” and Internet marketers who simply want to cash in on the ICO boom while they can. 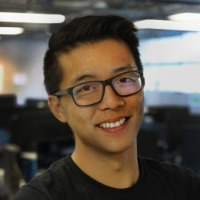 Their ICO ratings are de facto worthless as these platforms do not employ experienced analysts nor are they run by individuals who have the knowledge or skillset to evaluate startup projects. These are also the “rating agencies” that are more likely to encourage startups to buy a high ICO rating on their platforms. Of course, issues with rating agencies are not a new phenomenon. For example, the 2011 Financial Crisis Inquiry Report stated that at the time of the global financial crisis, the world’s three leading credit rating agencies (Moody’s, Standard & Poor’s, and Fitch) were “essential cogs in the wheel of financial destruction” and were “key enablers of the financial meltdown.” And this was in a sector that, compared to the current ICO space, was thoroughly regulated. 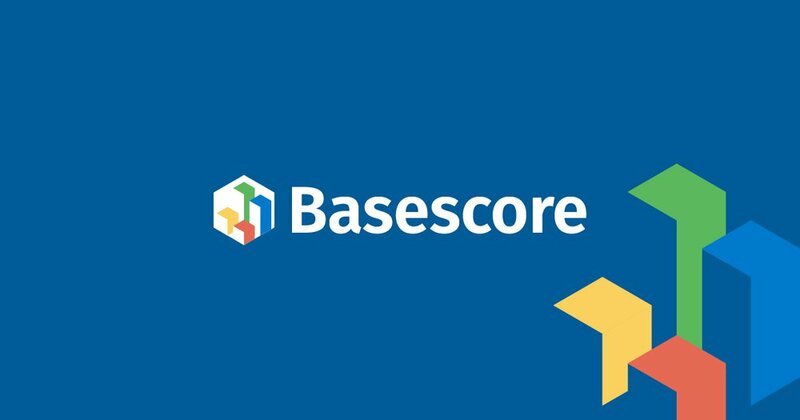 The Basescore Platform is free to use! We aggregate ICO reviews across multiple sources for easy reading and research. You can't trust information from just one singular source - that part is clear, and there's no way of knowing whether a source is trustworthy or not without actually doing the research. So what can you do? We're going about it a little differently at Basescore. Rather than tell you which source to trust, what if we aggregated all the reviews on an ICO that we can find and let you be the judge? That way, you can see the deviation from the ratings, and have a better idea of which one is paid and which one is not. If you can't beat them, include them all! Try out the Basescore Platform yourself today at https://basescore.co. We have built an ICO reviews platform called Basescore to help you stay on top of ICOs and tokens. We do things a little differently; we aggregate ICO review scores and more from the leading ICO critics to give users a singular, weighted Base Score that truly reflects how an ICO actually fares.Call us the "Metacritic of ICOs". We've aggregated over 7,000 ICO reviews under one roof. We're building the world's biggest ICO database to serve investors with truth and transparency, and we're making it happen right before your eyes. Learn more on Basescore today.